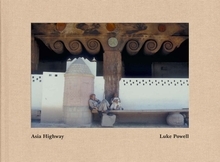 In Asia Highways, American photographer Luke Powell (born 1946) undertakes a photographic examination of Iran and particularly Pakistan, acknowledging the destruction these cultures have undergone while emphasizing the beautiful and good that Powell discovered on his travels. The photos in the first chapter were taken in Iran in 1974 and include the historical bazaar of Tabriz (a crucial center on the Silk Road and since 2010 a UNESCO World Heritage Site), while the succeeding chapters depict northern Pakistan. The story of the book’s origins orbits around various political events: Powell photographed a series on Pakistan’s Swat district after he had left Afghanistan just ahead of the Taraki coup in 1978; and in 2000 the Taliban invited him to return while restricting his subsequent movements, prompting Powell to travel to Pakistan and work in Chitral and Gilgit. Other chapters explore Peshawar and the Kalash people in Chitral. Clth, 15 x 11.25 in. / 232 pgs / 203 color. While travelling overland to India from Europe in the fall of 1971, Luke Powell ran into the war between India and Pakistan, and he spent the following winter in neighboring Afghanistan. Powell was stunned by the beauty of the country, the state of preservation of the culture, and by the Afghans' ability to be totally self-sustaining. He returned nearly every year until 1978, when he left the country three days before a Communist coup. Powell's ability to transform raw 35 mm film into refined printed images grew over a 15-year period, when he printed his work with the legendary Dye Transfer Process. The Afghan Folio exhibition travelled to over 120 museums and galleries in North America and Europe, during the years when the Russians were occupying Kabul. In early 2000 the Taliban government invited Luke Powell to come back to Afghanistan, and later that year the Northern Alliance allowed him to travel alone in areas under their control. 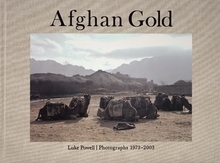 Through 2003 Powell took photographs for the United Nations Demining Program for Afghanistan and other UN agencies. In Afghan Gold Luke Powell has tried to separate art from journalism and show only the beautiful, traditional side of Afghanistan. In the text, published in a separate volume, Powell acts as a spokesman for an essentially peace-loving people who have been at war for the last three decades, placing the images in an unusually broad historical context. Slip, hbk, 2 vols, 16.5 x 12.5 in. / 224 pgs / 48 pg booklet, ill throughout.